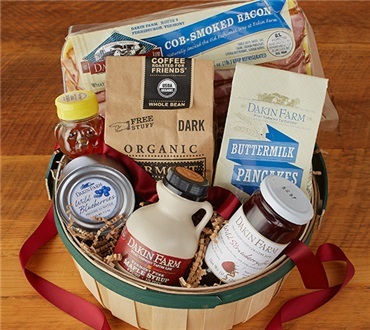 This full country breakfast is a wonderful gift to give or receive. Packed in our handled country basket or our distinctive gift box. For years I've been giving this and other variety of breakfast to my out of town family. This year I happened to be at their house for Christmas and saw the product we have been sending. I was embarrassed to have sent such a puny gifft. The image they show make it look much larger. While the taste was ok, it is not worth the money. I won't be ordering from this company again. I sent this out 2 a few people as gifts last year, but decided to buy one myself just to make sure the product was good. It was delicious! We like it so much that I sent as gift to even more people this year. We've had nothing but grateful thank you's from everyone. It's a really great product and it's packaged well. I don't know if I would send it during hot summer months as it is not refrigerated and we live on the west coast. best breakfeast package i have had! I look forward to my Dakin Farm package that comes every Christmas, from friends. I am cooking for one, so I freeze items that may not keep. I use them as treats and for special events. Nothing has ever gone bad, everything tasts fresh and has wonderful flavor. This is my most treasured gift!